Flying from Bangkok to Koh Chang (Trat). 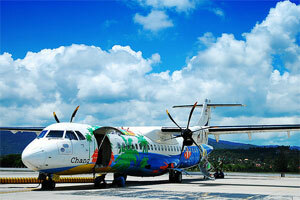 Bangkok Airways operate a regular service from Bangkok International Airport (Savarnabhumi) to Trat Airport. You can use the Bangkok Airways web site to check flight times. During high season there are 4 flights a day and in low season 2 flights. The Bangkok to Trat flight takes about 55 minutes. Trat Airport is about 20 minutes away from the nearest car ferry Pier, Aow Thammachat. The ferry runs every half an hour and the crossing takes about 30 minutes. An Airport Minibus shuttle service runs between Trat Airport and Koh Chang. The Minibus will drop off or pick up from your hotel. Transfer between Koh Chang & Bangkok are Direct. The journey between Koh Chang and Bangkok takes about 5 hours. Minibuses run between Koh Chang & Pattaya stop in Ban Pae to pick up visitors travelling from Koh Samet. The journey between Koh Chang and Pattaya takes about 4 hours. You should leave Bangkok on Highway 3, the Bang Na-Trad Highway. Choose the elevated road it is a toll motorway but is much quicker and safer, as there are less cars than the bottom road and the elevated road is in a much better state of repair.. Follow the signs for Chonburi and then the Pattaya & Rayong bypass. Turn off on to Highway 344 and follow the signs to Klaeng where you should turn left at the crossroads on to Highway 3, then continue towards Trat. About 20 Km's before Trat you should turn right on to the 3156 road and follow the road to Aow Thammachat. Leave Pattaya on Highway 36 towards Rayong and then join Highway 3 to Trat. About 20 Km's before Trat you should turn right on to the 3156 road and follow the road to Aow Thammachat. 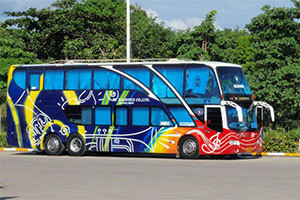 VIP bus and Coach services run between Koh Chang and Bangkok. Tickets can be booked through any Travel Agent or reputable Hotel. 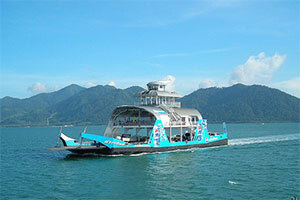 Buses leave Bangkok from 8.00am onwards and journey takes 6 hours to get to the ferry pier in Trat. If you bought a ticket without a complementary ferry crossing a tickets for the ferry can be bought at the piers. The crossing costs about 100 baht. There will be plenty of taxis waiting on the other side to take you to your destination once you reach Koh Chang. From Trat there are two car ferries, Aow Thammachat & Centre Point. Aow Thammachat should be the preferred drop off point. From either ferry pier on Koh Chang you can catch a taxis (Songthaew) to your destination on Koh Chang or hire a motorcycle at the ferry pier to continue your journey. Those of you travelling to the east coast of Koh Chang (i.e. Long Beach) should be aware that taxis do not normally travel this route and hiring a taxi for the journey can be expensive. The last ferry leaves from Trat for Koh Chang at 19.00 pm.